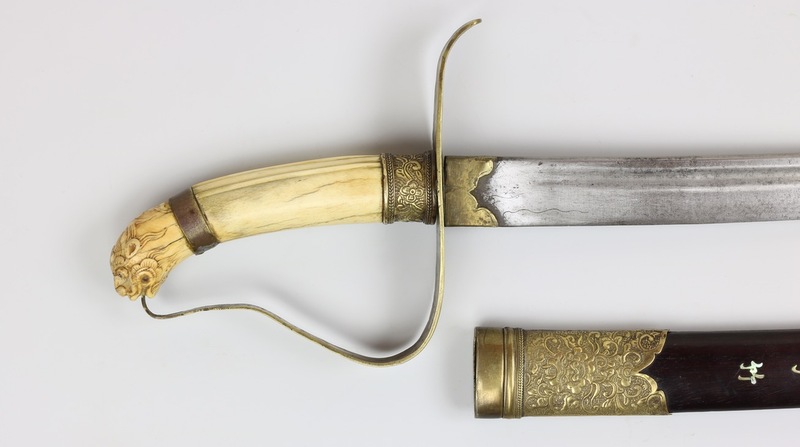 Ornate Vietnamese guom (narrow-bladed sabers) were carried by officers of the Nguyễn dynasty (1802 - 1945). Early Nguyễn emperor Minh Mang (ruled 1820 – 1841) claimed a Chinese legacy and sinicized his subjects, introducing Chinese clothing and an orthodox Confucianist model of state. He was well known for his opposition to missionaries, and his resistance to French involvement in the country. 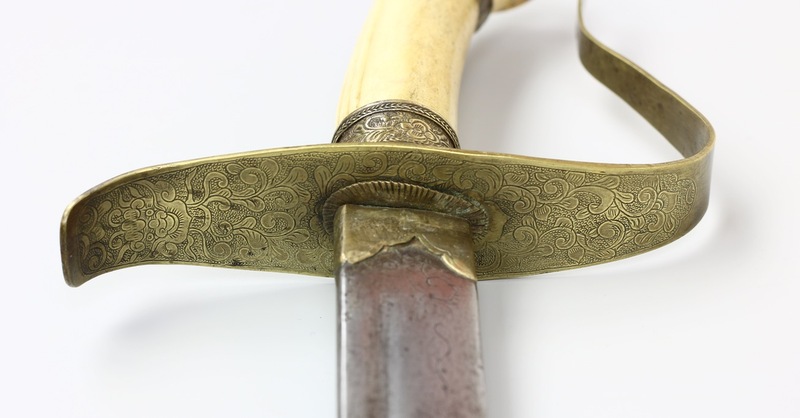 For sale is an interesting officer saber, or guom of the Vietnamese Nguyen dynasty. 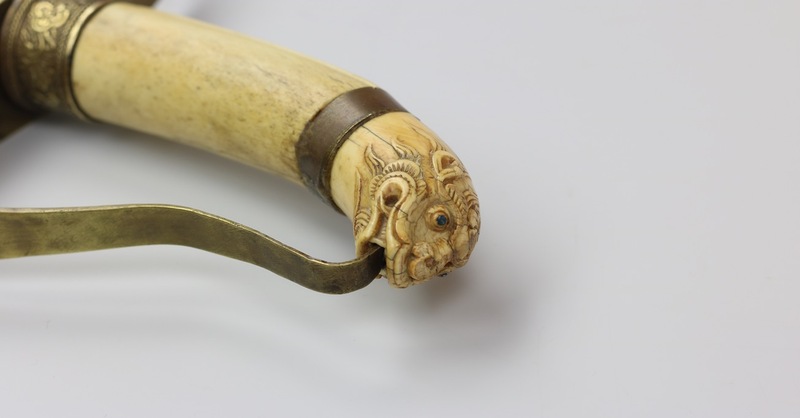 It is of the typical ceremonial format, with D-shaped knucklebow and lion head pommel. 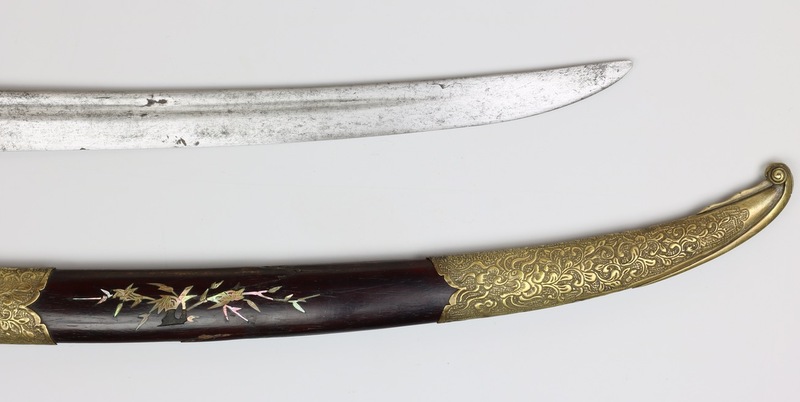 The rosewood scabbard is inlaid with mother of pearl, with a four character line on each side and representation of plants. Mounted in brass fittings with floral motifs and mythical animals in repoussé, including a stylized dragon on the chape and kīrttimukha or "faces of glory", demon masks that were believed to repel evil. The floral decor with kīrttimukha is repeated in engraving on the top of the guard. 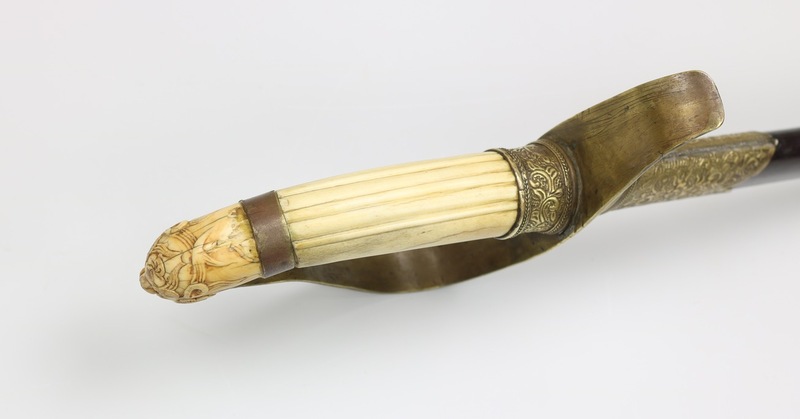 The bone handle with ribbed back has a separate ivory pommel, carved as a lion's head that swallows the lower end of the knucklebow. The lion's face is very nicely articulated, with piercing black eyes and well-defined manes. Some repairs to the scabbard wood and chape, some losses to the mother of pearl inlays. 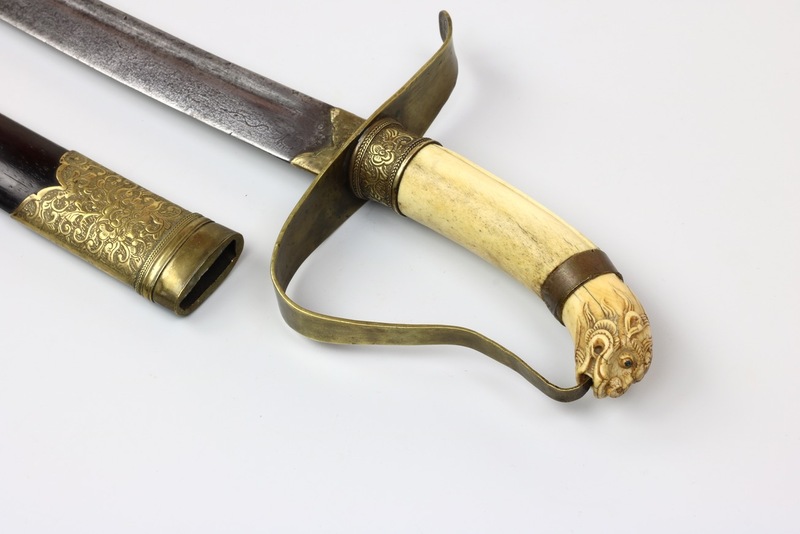 The most unusual feature of this saber is the blade. 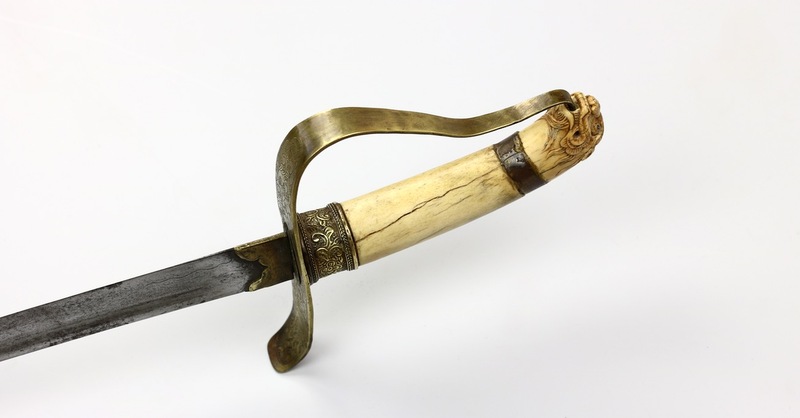 This type of saber is almost always mounted with a light, thin and purely ceremonial blade. 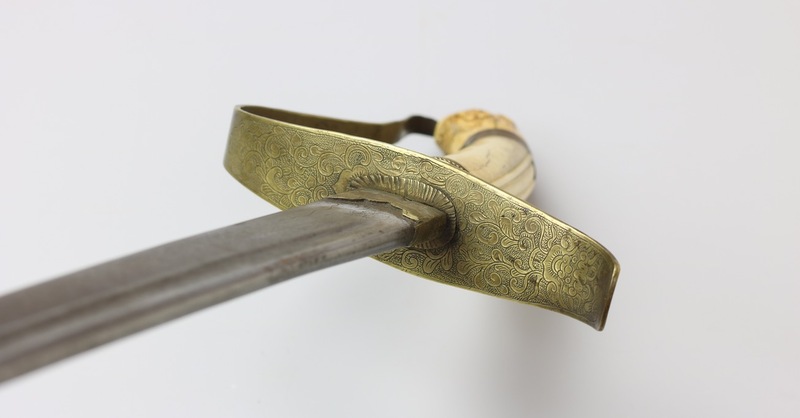 This one contains a full fledged fighting sword, starting an impressive 8 mm thick at the forte, tapering to 4 mm halfway. The short, stout blade is well-balanced. Signs of field sharpening suggest it has seen service. 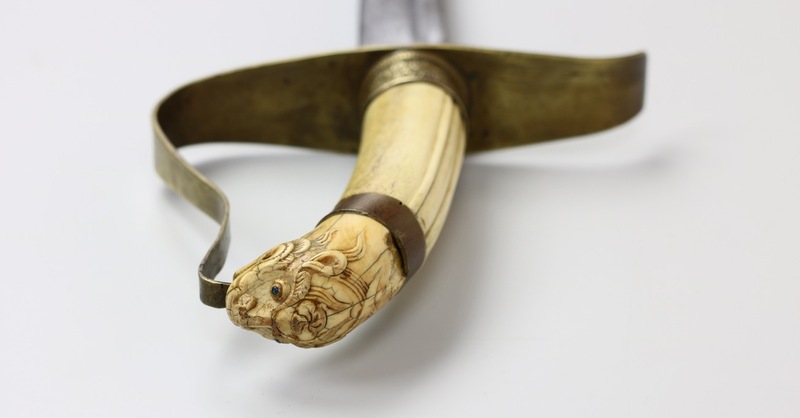 The mother-of-pearl scabbard inlays are interesting. The text is in archaic Chinese. 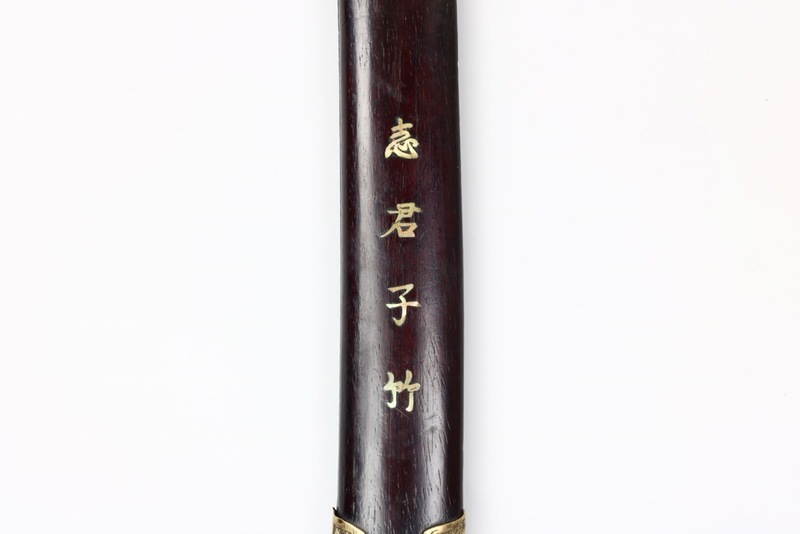 The left side says: "大戈夫松" ( dà gē fū sōng ): It doesn't make much sense: Literally "Great Dagger-Axe" "Conscripted worker / Husband" "Pine (tree)". However, if we remove the dot on the second character it does make sense: 大丈夫松 ( dà zhàng fū sōng ) "A true gentleman is like a pine." The other panel on this side is inlaid with plum blossoms. 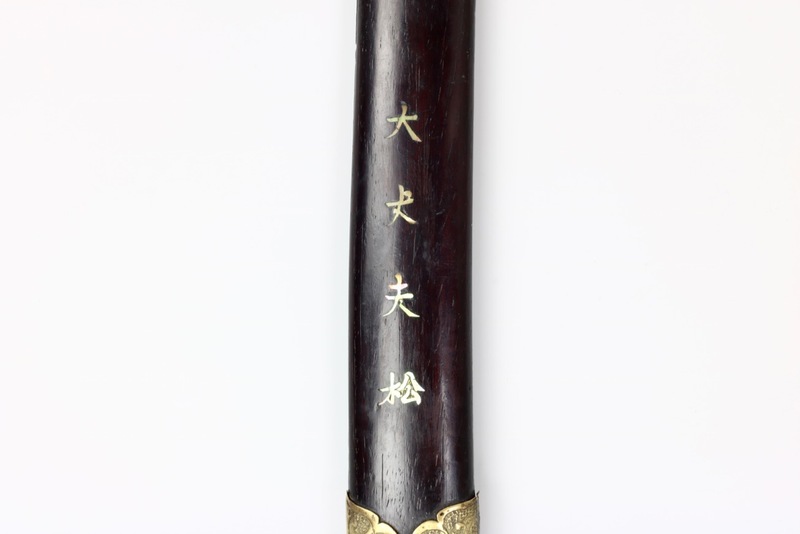 The right side inlaid with "志君子竹", translating to "Will" "Gentleman" and "Bamboo", loosely translating to: "A gentleman's will is like bamboo". The other panel on this side is decorated with bamboo shoots in mother of pearl inlays. Pine (松) is regarded as a symbol of longevity and endurance. Bamboo (竹) is a symbol of longevity and vitality because it can survive hard natural conditions while remaining green. It also represents the qualities of strength, flexibility and resilience, since not even the fiercest storm can break bamboo. Plum blossom 梅花) is the first flower to bloom each year, it stands for perseverance and purity. When shown together on an object, the pine, bamboo and plum are known as ‘The Three Friends of Winter or suihan sanyou (歲寒三友). They flourish under hard conditions, and are symbols of perseverance: Virtues attributed to the scholar-gentleman. 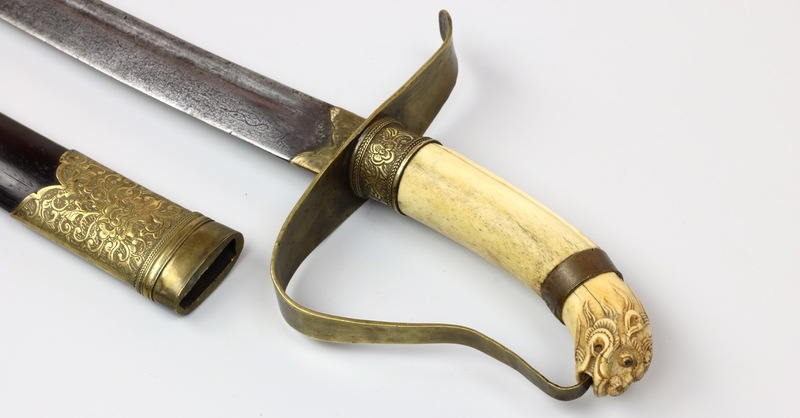 A rare type of officer guom that successfully combines the properties of ceremonial guom with a full-fledged fighting blade. 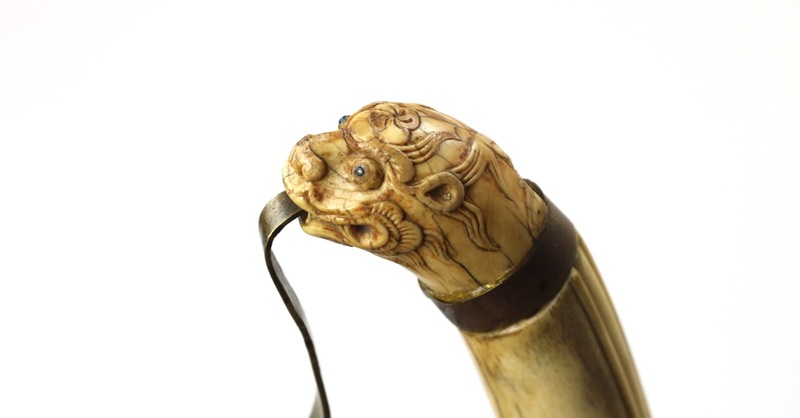 The decor on the scabbard presents us with two intriguing lines of classical Chinese text, of unknown source, that seem to celebrate the qualities that make a true scholar-gentleman. 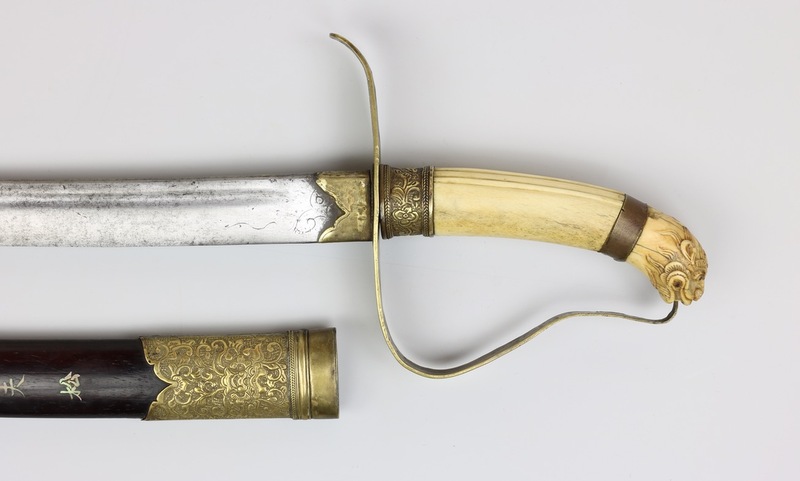 Together with the fighting blade, this antique Vietnamese saber is a successful marriage between the martial and the scholarly: An ideal in classical Chinese thought.